Monks Mound, the largest of many mounds at Cahokia Mounds State Historic Site in Illinois. Contrast the size of the mound with the tiny car passing by on the road! 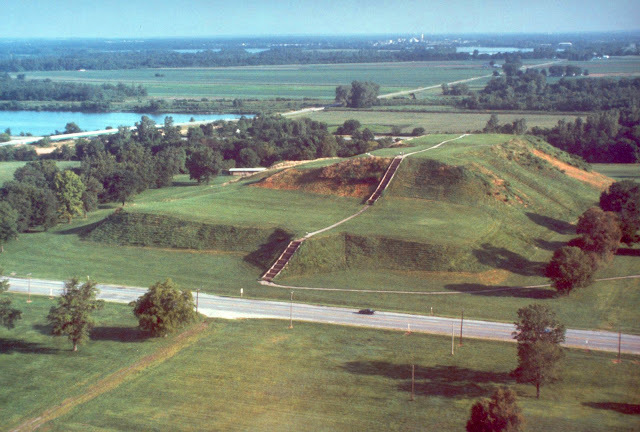 Photo courtesy of Cahokia Mounds State Historic Site. Click on the photo to enlarge. museum park links in the Tourism Guide after the short excerpt below. 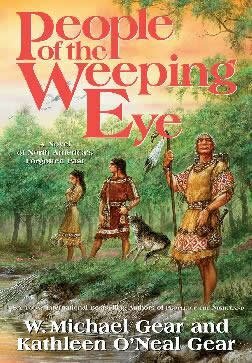 They were each once powerful kingdoms that stretched their influence far down the rivers they overlooked. lived and breathed in a time long before our own . . . THE THUNDER . . .
shimmer and wink against the winter night. Click to enlarge photo. NPS Photo by Chris Mekow. periodic floods, but it was strategically placed just below the river’s bend. trade route carrying goods between the southeastern and northern river systems. and healthy muscle. It lived, thrived, and bristled with energy. night, as though weighted by the countless sleeping souls they sheltered. Another Shiloh Mound stands quietly among the trees. 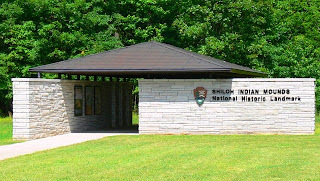 NPS Photo by Chris Mekow. and streamers by the flood. Another Shiloh Mound surrounded by fall leaves. in time to her skipping feet. The Song played within her. promised, her body spinning in time to the melody. voice remarked . . .
real places, although they had never included tourism links. 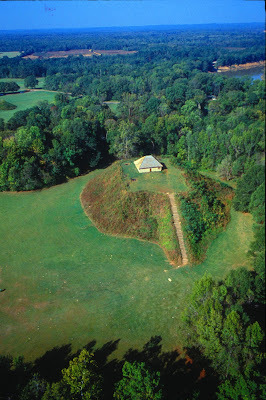 Temple Mound at Moundville Archaeological Park. but also when Cahokia is already in ruins. Searing Wind, shows it also in ruins in another time period. and the real places that their characters once lived in. What do authors Kathleen and Michael Gear think of literary tourism? Click here to read in their own words.